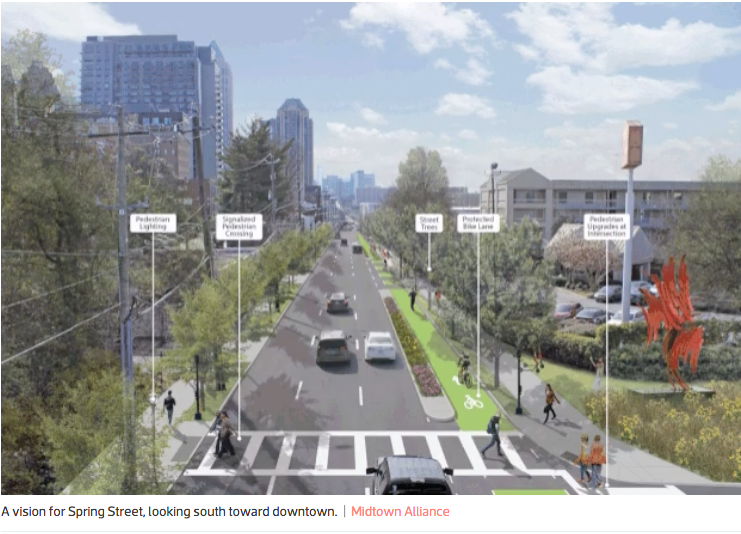 While many promised “complete streets” projects are in limbo, awaiting the results of Renew Atlanta and TSPLOST officials’ “rebaselining” efforts, Midtown leaders are moving forward with plans to overhaul a couple of busy corridors to accommodate more than vehicles. Currently, Spring Street, which runs one-way south, and West Peachtree Street, which runs north, are designed to allow cars to zip on and off the Connector expressway seamlessly. But seemingly endless development is happening along those roads, especially closer to Tech Square. And high-speed motoring isn’t exactly conducive to the sort of environment many Midtown dwellers desire. So Midtown Alliance, with the help of the City of Atlanta and Georgia Department of Transportation, is mapping out complete streets plans for Spring and West Peachtree streets. Tentatively, the approach calls for putting both corridors on a road diet, which means nixing a car lane in exchange for cyclist and pedestrian infrastructure, such as bike lanes and wider sidewalks. The idea is to slow motorists down. Midtown Alliance officials have been studying drivers entering Spring Street from the highway, and it seems many have trouble easing into the 35-mph speed limit. The proposals also outline plans to spruce up the thoroughfares with new streetside trees, public art, and ADA-compliant ramps and crosswalks. The Spring Street section of the complete streets initiative kicked off in early 2018, and the projects—including West Peachtree Street’s—recently matured to the design and engineering phase. 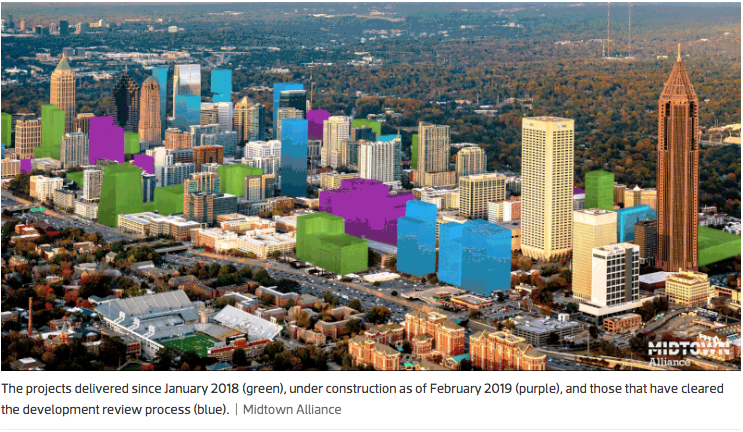 It’s all part of the Midtown Transportation Plan, which was integrated into a transportation plan the Atlanta City Council adopted in December. The need for complete streets and other transportation infrastructure upgrades was reinforced by a 2016 survey Midtown Alliance conducted, in which 94 percent of the 3,500 participants said increased walkability needs to be a top priority. That’s not the only study that shows Atlantans want to become less car-dependant. A Renew Atlanta and TSPLOST survey, which closed last month, found that complete streets projects are a must, according to the 1,500 people polled. In related news, the John Portman and Associates-designed Coda office tower—one of three Portman projects on a short strip of West Peachtree Street—opens today, adding to the long roster of newly delivered developments in Midtown.